In my last entry here five years ago, I posited that Charles Leon Schmitt was the son of Anna Soulliere, but not of Robert Schmitt, listed on his death certificate as his father. Since then, I have looked at the probate records for Robert’s father John Schmitt. John was a wealthy liquor merchant who owned a lot of land, although based on the probate records, maybe not really all that wealthy; he was mortgaged up to the hilt. His probate records go into a lot of detail about his family. He had several children, a number of whom had died before John did in 1900 (and, interestingly, some of his children even show up in the probate records without having died, the result of their wives petitioning the probate court to take over the family finances due to their spouse’s alcoholism, perhaps an occupational hazard of being a liquor dealer). So for any sons who had died but had children, there was a list of those children as John’s heirs. There was no listing for children of Robert. Given how thorough the listing was for the children of other sons and daughters of John Schmitt, I believe that the children listed elsewhere as children of Robert and Anna were not Robert’s natural-born children. They weren’t seen by the Schmitt family as Schmitts. John Schmitt was thorough about noting his heirs, and it seems to me that there was no break with Robert during Robert’s lifetime; he died working on his father’s farm, after all. Not to say that Robert wasn’t a father to them, but it seems to me that, given the timelines, it is far more likely that Charles, Minnie, and Stella were Anna’s children. Robert may have adopted them; I have not found any record of that, and given that adoptions before the 20th century were often informal, I don’t expect to. So now I was faced with trying to figure out which Soulliere family Anna belonged to. There were several in the Detroit/Windsor area at the time, some of whom had a child named Anna/Annie, none of whom seemed correct. The marriage record for Ferdinand R. (Robert) Schmitt and Anna Sutheir (Soulliere) Kleiber in 1891 lists her father as Leon. Their marriage affadavit gives her mother’s maiden name as Girardin, which seems to be an Anglicization of Desjardin (I’ve seen the name Gardner used for some Desjardins in the Detroit River region, too). The marriage record in Ontario for Annie Smith and Joseph Stanley gives her parents’ names as Leo Soulliere and Ang followed by something unclear that might be Desjardins. 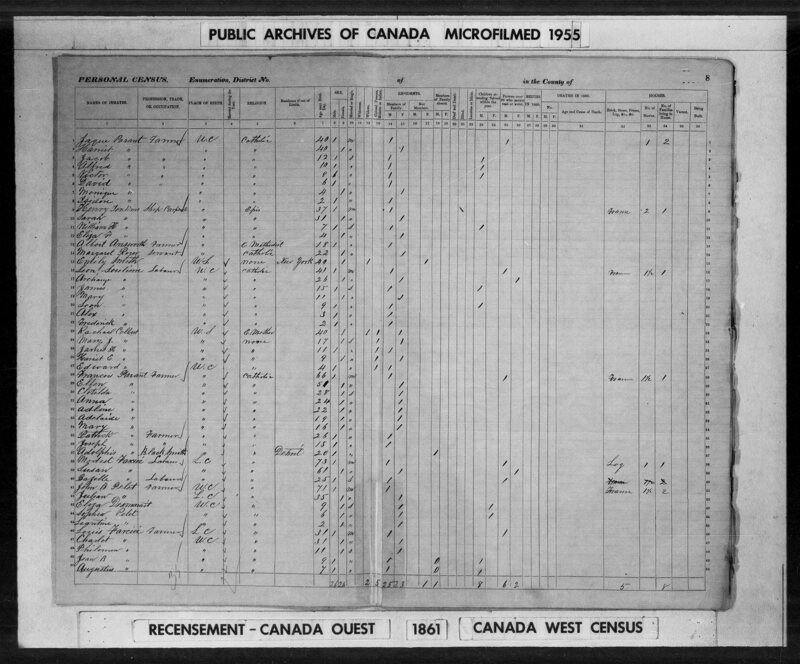 Leon Soulliere and Archange Desjardins were listed in the 1861 Census in Canada with children James (age 15), Mary (age 11), Leon (age 9), Alex (age 3), and Frederick (age 2). By 1880, 19 years later, they had moved to Grosse Pointe, Michigan, where they are living with their children Frederick (age 20), Agnes (age 16), Josephine (age 14), Gilbert (age 13), Edmund (age 11), William (age 8), Louisa (age 6), and Ida (age 3). No Anna. I have been unable to find the family of Leon Soulliere in the 1870 US Census or 1871 Canada Census. Anna appears to have been born in about 1862, just after the 1861 Canada Census; she would have been 18 by the time of the 1880 Census, and based on the birth date of Charles Leon Schmitt from his death certificate, was probably living with her husband and newborn child at that point, not with her parents. I have not been able to find them in the 1880 Census. Father Christian Dennison wrote a book, Genealogy of the French Families of the Detroit River Region , which was published by the Detroit Society for Genealogical Research in 1976, and revised and republished in 1987. The index to the book is freely available on the DSGR web site, and the entire contents of the book is on the web site for members of the society. I am a member, so I looked through the book. They have the family of Leon Chrisostome Soulliere listed, but again, no Anna. Bingo! We know from the marriage record of Annie and Joseph Stanley on December 21, 1899, little over a month after this petition was submitted, that Anna was going by the name Annie Smith after the death of her husband Robert Schmitt. The list of Leon and Archange’s children appears to be in order of age, based on the censuses. She would appear to have been born between 1861, when she is not present in the Canada census, and 1864, when her sister Agnes was born. That fits right in with the derived date of about 1862. Anna and Charles Leon didn’t leave a lot of footprints in the records. It has been a real challenge to tease this out. It’s possible that something may show up that throws a monkey wrench into this, since I have not been able to find anything connecting Charles Leon to Annie while he was a child; the best I have is Charles’s death certificate and the connection via city directories around 1900. But I am reasonably confident at this point of my conclusions here. Leon Chrisostome Soulliere, as mentioned, shows up in Father Dennison’s book. The book isn’t perfect; it is known to have some mistakes, and everything there should be verified. But based on what I see there, it appears that my French-Canadian ancestors have been in the Detroit-Windsor area for a very long time, back to maybe the 1750s, and possibly earlier, and in Québec going back into the 1600s.